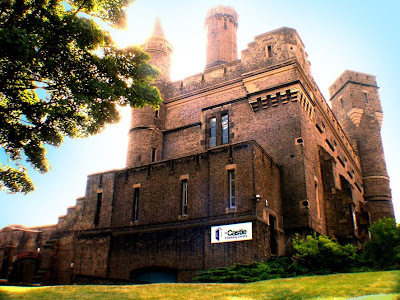 It was fantastic to get back to the Castle Climbing Centre, I haven't been brave enough to venture there for so many months because of being so self-conscious about my size. Yesterday, however, I strode into the communal changing room without any fear of who would be staring and judging. You have to understand that, on the whole, climbers are a lithe, lean and fairly well muscled bunch of folk - I've felt anything *but* any of that in recent months until now! My good mood was lifted further by the fact that I had to tighten the leg loops on my harness (I leave them locked as it's only the waist band I need to loosen to get it off/on me). This is my harness btw, it's a Black Diamond Primrose AL climbing harness and it's uber comfy. I've had it for years, should probably wash it at some point, it doesn't look as brightly coloured as the one in this pic!! 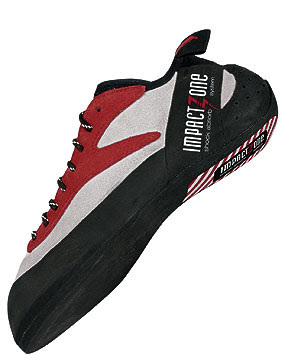 These are my rock shoes, they're Red Chili 'Spirit' laceups... I *had* wanted to get velcro ones but as I'm tall my feet are pretty big for a girl, and they didn't have women-specific shoes when I went to try them on - so the shoes fit lengthways but were *far* too wide for my feet! However... 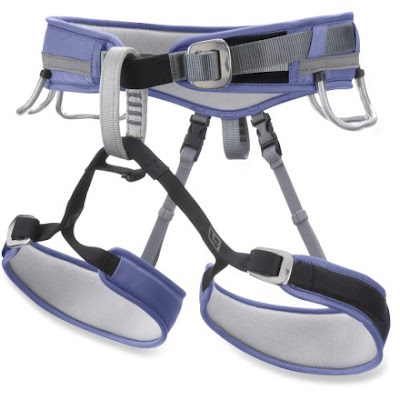 I was browsing through a copy of 'Climb Magazine' and I saw a pair of Boreal Luna Rock Shoes advertised... ooh they're luuuurvly and will go with my purple harness! I'll have to go and try a pair on in a shop though as I seem to recall that I didn't quite like the fit of the Boreals that I tried on when I was shopping for my current shoes. In any case, I'm not going to buy them now as a) I'm a bit broke after spending a fortune on clothes for the photo shoot and b) I'm going to use them as a weight-loss incentive... If/when I get below 10 stone I will get myself a pair - how's that for encouragement?! So anyway, sorry I went a bit off track there... I got changed and joined Joe and our friend H in The Quarry. His other climbing buddies were away so it was just the three of us, which isn't the best dynamic when you're going climbing truth be told!! He's also a bloody fast runner, one of the fastest in our club... e.g. sub 02:45 marathons, sub 34 minute 10km. His brother is a bit faster, which must be annoying but then H is into anything and everything - we was competing in an adventure race last weekend, which he and a fellow Serpie won, it involved mountain biking, running, orienteering etc, sounds like fun!! The first couple of climbs of mine were rubbish!! Then I switched to even easier routes on the Rockley Wall and found them a bit more do-able! I left Joe and H for a bit to have a go on the ground floor travel wall but that wasn't that much fun so I ended up going to the next floor to do some bouldering in the quarry. That was a lot of fun, but the thing about using the bouldering walls is you're meant to start from a seated position and pull yourself up - I discovered I'm not that good at that! Also when I was bridging across two holds on the back wall (see where woman is in green top in the pic in the link above) and I felt an almighty (and uncomfortable!) 'pull' in the back of my glutes and hamstrings which highlighted how inflexible my legs are... must. stretch. more! My hands hurt after the bouldering. Although I do a lot of training with heavy weights, I always wear gloves, so my poor palms felt red raw!! I then caught sight of Joe and H so we went up to the first floor level to where the *really* high walls are and finished off the night on one of the new Taller top roped routes, it's really scary once you get all the way to the top and turn round and look down!! After our climbing exertions we decided the only sensible, and polite thing, to do would be to visit the local public house for a nice well-deserved pint and some yummy Thai food. The pub across the road to the Castle fulfills all this and more. It's very much an 'old man's pub' but it's still nice and the food is lovely and cheap (although not the largest of portions). Ordinarily I would have sat and ummed and erred over the menu until I finally made the choice between the Pad Thai noodles with chicken, or the Massoman Curry. But yesterday I wanted neither! I fancied something with a bit of a kick and the idea of a plate full of noodles really did nothing for me! It's funny how your tastes can change so dramatically in the space of a few months! I opted for the red curry in the end which wasn't the healthiest of options as there was coconut juice aplenty in it. But I had definitely earnt it after my climb and besides I was famished having forgotten to take my Promax Crisp bar with me to munch en route to the climbing centre! Ooooh, I so want to do this, um, until you mentioned the bit about how lean and toned the other climbers are. Uh, but its OK, I will be learning in Dundee where lean and toned doesn't seem to exist, phew! So glad you enjoyed it - what a great venue. I did my Level 2 Line Rescue course at The castle. A great venue. only in England would they have climbing walls inside a castle. Sounds like a lot of fun. My hubby used to climb, but not so much anymore, a frgment from a grenade in Iraq limited his leg mobility. Looks fun. Love a climbing wall inside a castle. Are you kidding me?! I want to try. FFM - not *all* the climbers are lean and toned, but the majority are... I don't look anywhere *near* as buff as they do, but I look a lot better than I did the last time I went! If I climbed as often as they did I'd look just like them too I reckon!! Lizzio - yeah, rock climbing rocks (sorry, that was lame, couldn't resist though!) - it's so much fun and a great social thing to do for me as I'm so antisocial when it comes to running and weight-training!! Dave - when did you do that? it's changed so much over the last year, it's fab, there's higher scarier walls ha!! cmoursler - sorry to hear about your hubby's leg :-( can't he have it removed or is it too far imbedded? Dayne - I don't think it 'originally' started out as a castle, I think it was some sort of processing plant, lol!! but it looks great though and has earned its name huh?! I think it must have been a good couple of years ago, maybe more. We abseiled off of the high tower outside as the final confidence exercise. Most of the stuff we did was setting up rescue systems inside.